"Time and music is a funny thing"
For American musicians Nicholas Georgieff and Virgil Work Jr., Workdub has been a part of their lives for over 30 years. The project that worked out of Nic’s basement studio in St Louis, Missouri between 1987 and 1997 initially released one private press LP and two small-run cassettes. Today, 20 years later, word-of-mouth interest has resulted in Workdub’s first widely distributed label releases. Beginning with 2016’s Workdub 12” on Music from Memory and now Australian reissue label Left Ear Records have collected together 10 tracks for Subterranean (1989-1995), pooled from the same recordings. I got in touch with Nic and Virgil via Left Ear to unpick some of what made Workdub work. For the unfamiliar, Workdub fused funk, dub, ambient and jazz into loose and live-sounding, improvised leftfield synth-pop, produced over 10 years of ‘Workdub Wednesdays’. Before they got together, Nic trained in composition and released jazz / experimental funk records in the 80s, including the After Hours LP and Khyber Pass 12” on his ‘dubit’ label (featuring Marc Higgins who would later become a key contributor to Workdub). Virgil had put out cassettes on WorkPlay, including 1987’s Fast Forward as A Work of Art, a selection of these tracks have recently been reissued on a Vincent 12” on Music from Memory. The pair met in 1987 whilst Nic was working on the Blueview album for dubit and shortly after started making music together. 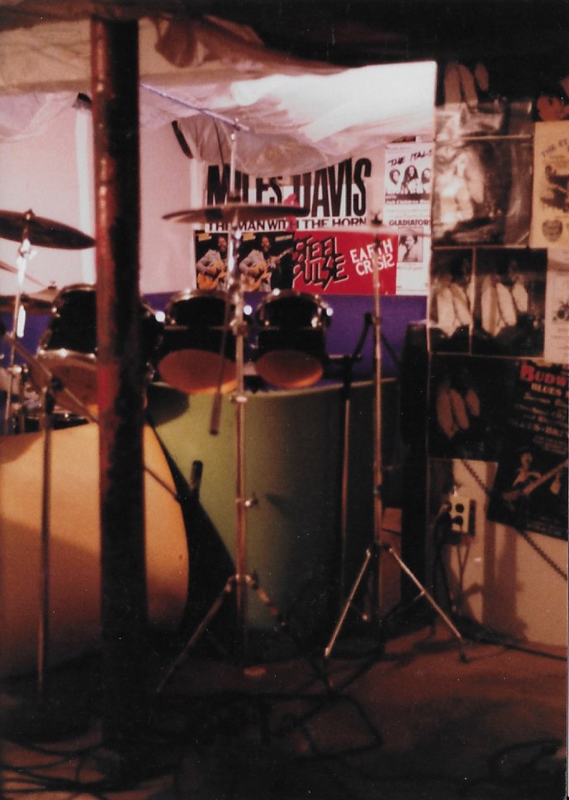 After handling all writing and production on the first LP Workdub I (1989), they expanded on cassette releases II (1992) and III (1995) to include sax, guitar and live percussion players drawn from the wider community of St Louis studio players. 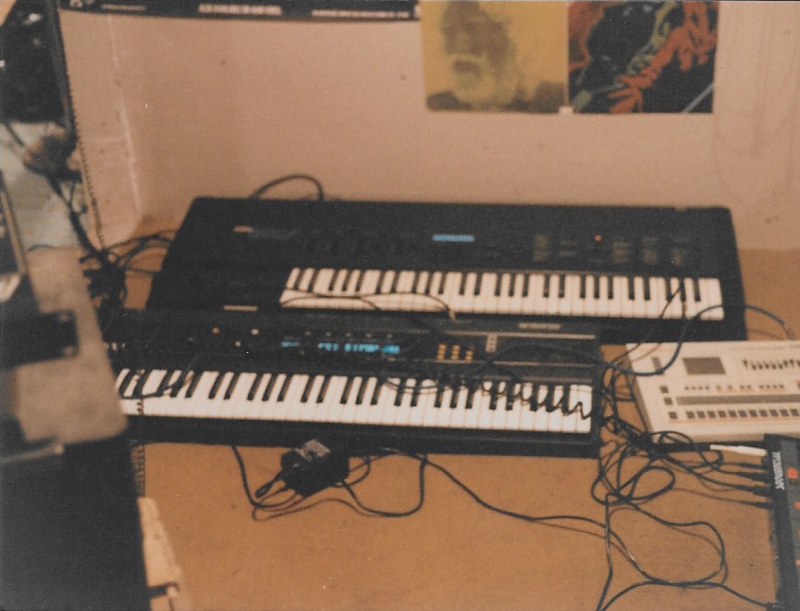 These included long term collaborator Marc Higgins, who played guitar and saxophone on 13 tracks over Workdub II & III. I found it telling that when I asked Nic and Virgil about the project they pointed me towards a document entitled Workdub History (now in its 5th iteration) that reads part musician bio, part family history. ‘Time and music is a funny thing’ one section reads – no kidding. The Workdub name, a fusion of Virgil’s label ‘WorkPlay’ and Nic’s ‘dubit’, seems to echo their organic approach to recording – a way of working ideas out through music that characterises the sound. 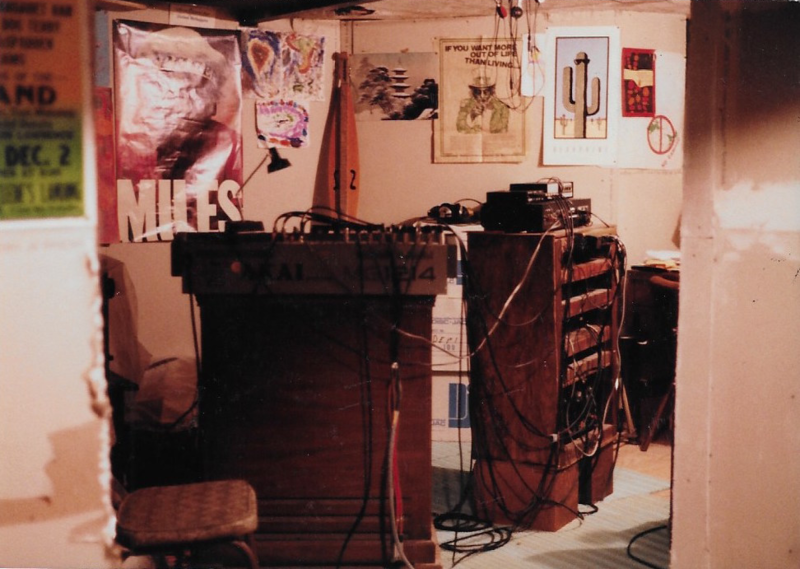 The photos of Nic’s basement that they generously shared with me show a economical studio setup: equipment perched on top of boxes, trailing wires connecting synths and rhythm machines, posters and fabric line the walls – it wouldn’t look out of place on a Dischord Records sleeve and this DIY attitude is a thread that runs right through their work. 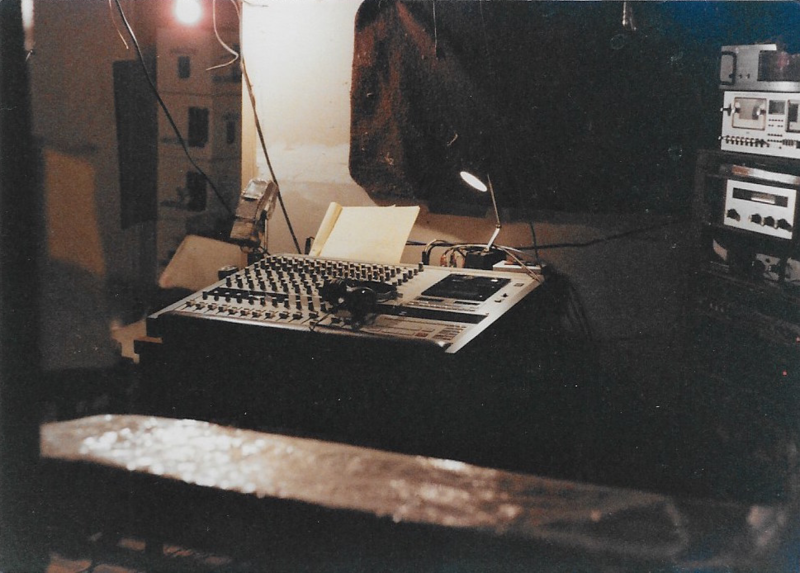 What really strikes you about the tracks on Subterranean in the context of the tactile, hands-on approach that characterises electronic music making right now, is how ahead of its time Workdub sounds. That music this calmly futuristic and unfamiliar came out of St Louis in the late 1980s/1990s makes it tempting to see the group as something of a black box. Conversation turns to their recording setup, Urban Island Studios, located in the basement of a house in the west of the city near to Forest Park. Virgil explains “Every house in the neighbourhood was completely different, not like the cookie cutter homes you see in the modern day subdivisions. And this house was even more unique. Nic is a professional landscape and garden designer. The front yard was all vines instead of traditional lawn grass and the backyard was so special it was featured in a local magazine.” Nic focusses in “The garden was a gift to my wife. It was a Japanese garden and was an escape from the city around us – like Workdub – it really was it’s own private world. Like making music, landscape and garden composition is very similar. Just the right spaces, the right placement, axis points, not too much and not too little. Pauses and crescendos, weaves and textures.” Pictures of the garden and scans from the magazine article are below – thanks to Nic for sharing these. I asked Virgil and Nic a little about how they worked “We recorded track by track, improvised and with nothing planned out in advance. Some songs were conceived, evolved and completed in one recording session with tracks done in one take. Other songs took multiple sessions where tracks were laid down and affected with overdubs on successive visits. Nic was fascinated with using not only selected parts of recordings made; but also how one could massage and manipulate those parts into something else by removing, affecting with tape effects and digital delays. This spawned endless possibilities; even within the constructs of one consistent rhythm.” Check out some pictures of the studio below. At the centre of Workdub productions was the AKAI mixer that can be seen proudly displayed on record labels (original and reissues) and splashed across homemade T-shirts (see above). 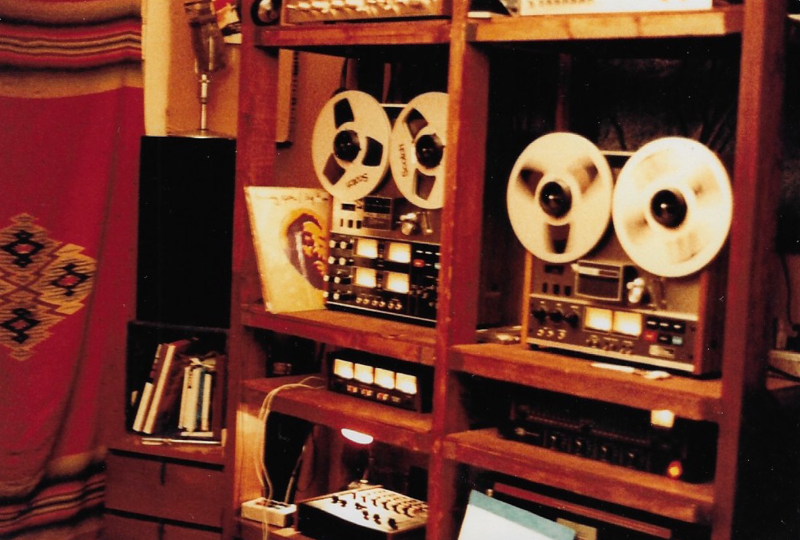 Before home computer setups allowed you to arrange and rearrange tracks on a software timeline, they recorded on reel-to-reel tape and mixed down on the fly. Instruments were played and overdubbed live, with percussion parts and keys played by hand – ‘mistakes’ a permanent part of the recordings. A word I return to with the group is ‘industrial’, something that initially feels at odds with the serene setting of Urban Island Studios. However, watching David Roustio’s 1992 video for ‘Subterranean’ and its images of freeway traffic and city sidewalks exposed with frames of graffiti and night driving sequences, industrial seems an oddly fitting description for the Workdub world of work-a-day jobs and subterranean creation. The results of their efforts were untitled albums, the group’s focus released simply as a number in sequence – always just Workdub. In attempting to wrap this up I asked Nic and Virgil what it was like to call time on what they created all those years ago and how they view the recent, delayed interest in their music. Nic is at peace: ‘Back then you had no chance of exposure without having to succumb to the Music Business and A & R folks. It was a very tight, caste system and the music you made had to be able to be labeled a certain genre or type, to find a way into a record store’s bin. Glad to see that has changed for the better – those who have a passion for the art can create and distribute their work without the middle men, money manager types.” That the two kept in touch without revisiting music together may be what has allowed Workdub to enjoy its second life now, so ‘ending’ is a misnomer. “We didn’t call time” corrects Virgil “it just eventually happened over time. It was more like snow melting off of a roof. After that it kind of took on a life of it’s own… We are still Workdub.” Nic continued with his career as a garden designer and Virgil continued to work in IT, just as he had before, but now on Wednesdays too. Sincere thanks to Nic and Virgil for their patience and generosity. Thanks to Chris and Anthony at Left Ear Records for introductions and putting out the record. Workdub’s Subterranean (1989-1995) is out now.